Putting a new airliner into commercial service after flight tests and certification is a challenge, and it is vitally important to ensure that stocks of spares are in the right places and quantities to support service entry. Satair Group’s Programme Management Group in Hamburg together with many other departments, including the team at the Dubai spares warehouse, have worked hard on the initial spares provisioning for the A350XWB. Launch customer Qatar Airways took delivery of the first of their fleet in late December, and a key priority has been to ensure spare parts are located at the Satair Group Dubai facility ahead of service entry. This 3,700m2 facility was opened in 2008, and has progressively expanded services to support the full range of Airbus types. Today, some 80 percent of the spares sent from the facility directly support regional MENA customers, with the remaining 20 percent supporting customers around the world as part of Airbus’ global spares provisioning. And recently to support the A350XWB, and the ever increasing Airbus fleet in the region, a further capacity expansion in Dubai of 800m2 has been secured. 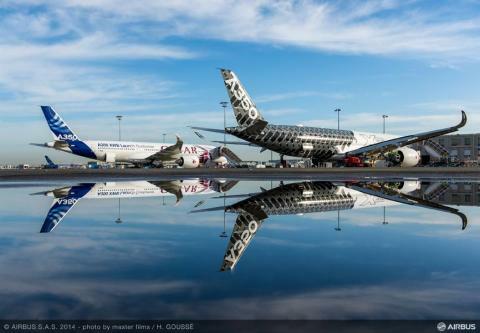 A multi-functional team co-ordinated by Lars Pahlmann, A350XWB Programme Management, worked on A350XWB spares provisioning but had a shorter working timescale compared to working with the A380 – 18 months from first flight to service entry for the A350 compared to 29 months for the bigger aircraft. Spares and tools have also been shipped to Qatar Airways and a Material Support Manager is on-site in Doha to provide assistance. Other major spares shipments are also being made to Satair Group warehouses in Singapore, Europe and the United States to support service entry for the A350XWB with Vietnam Airlines, Finnair and LATAM.